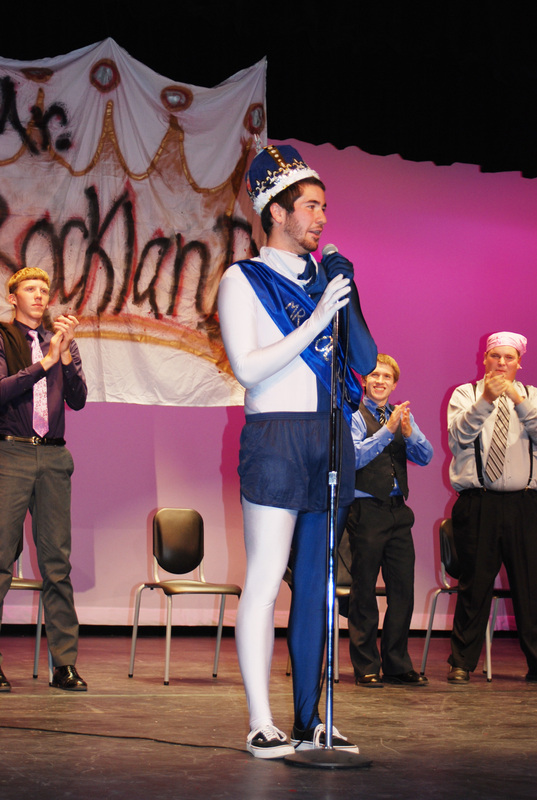 Mike McCauley performs during the 2012 Mr. Rockland competition. 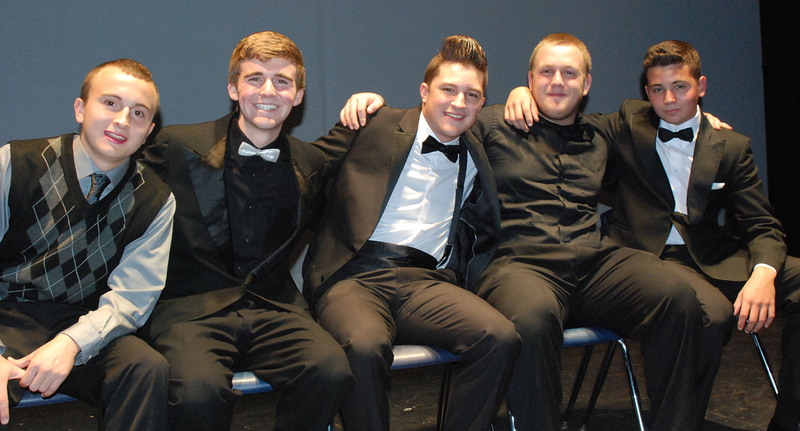 The question will be answered when six seniors take the stage in the annual Mr. Rockland contest, sponsored by the Student Government Council. With this year’s cast of characters, Pearse McNally, Leshon Crawford, Eddie Yeadon, Andrew Frazer, and Chris Landy, it’s sure to be a close race for Mr. Rockland. In years past one part of the competition was improvisation. However, this year they have replaced that with dancing. For the dancing competition all the contestants will be on stage and a series of songs of all different types of music will be played. The contestants will have to put on their best dance moves for each song. This new part of the contest was the decision of SGC Finance and Fundraising Chair, Lexie Carchedi and SGC advisor, Kristen Walsh, who will be running this year’s Mr. Rockland. Due to the unexpected prom request by last year’s Mr. Rockland, Derek Crowe, contestants are advised they will be automatically disqualified if they ask anyone to the prom. One of the contestants, Pearse McNally, was asked why he signed up. He replied, “It’s been expected of me.” Looking ahead to winning the event, he said, “Obviously the Chipotle gift card would be swag and so would front row parking.” But, McNally says, he believes that everyone is a threat and there is so much talent this year. Another RHS favorite who will be running is Andrew Frazer. He has one thing on his mind when it comes to winning and one thing only: “Be better than everyone else.” Looking back at past Mr. Rocklands Frazer said, “Mike McCauley’s performance a couple years ago [was the best] because of him playing a ukulele and him dressing up in a coconut bra.” Since Andrew has been known to be a good singer from Rockland High’s own production of High School Musical should we be expecting a lyrical performance in a funky outfit? Eddie Yeadon says he is eager to get up on stage for the first time. Yeadon says he signed up for Mr. Rockland “because I want to win.” With this motivation, there is no telling what he could have planned for the night. Judges for the event will be Mr. Casagrande, Mr. Damon, Mr. MacAllister, and Ms McDonough. The Mr. Rockland competition will be held Thursday, Oct. 23 in the auditorium. Tickets are $5 and will be sold at the door. Don’t miss it! 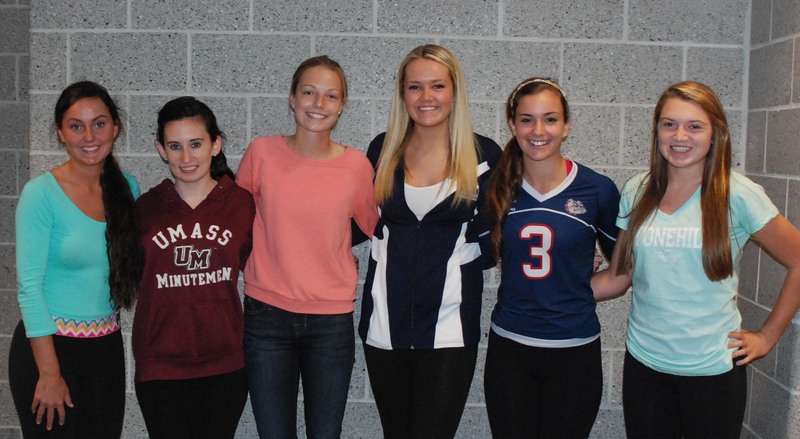 On Thursday, September 25 it was announced that the nominees for this year’s Miss Rockland will be Katie DeLorey, Alex Pigeon, Brianna Starkey, Kara Penney, Danielle Whitcher, and Nicole Cook. The six girls will compete for the Miss Rockland tiara and the winner will be announced during halftime at next week’s Homecoming football game. In order to become a member of the competition girls were nominated by their teachers. Teachers were asked to base their nominations on who they believe is a positive role model, has school spirit, shows kindness towards peers and teachers, participates in extracurricular activities, and shows effort in school and assignments. For the results and more about the Miss Rockland competition be sure to pick up the October issue of the Veritas. Senior captain Brianna Starkey in a game vs. Hingham earlier this year. The fall sports season is well underway and the teams have been successful with all making it into the win column. The week was an exciting one with the girls and boys soccer teams playing a doubleheader under the lights at Abington on Wednesday night. The girls came away with an easy 6-1 win while the boys dropped a tough one 2-1. The golf team picked up its second win on Monday beating EB 29-25. Volleyball defeated Randolph 3-0 on Tuesday but followed that on Wednesday with a loss at Whitman-Hanson. With a record of 2-0, the football team prepares for their game tonight at EB. Fans will remember last year’s three games with EB: the win at home and the losses in the D5 play-offs and on Thanksgiving Day. Revenge may be on the team’s mind but mostly the goal is just to keep the string going this year. 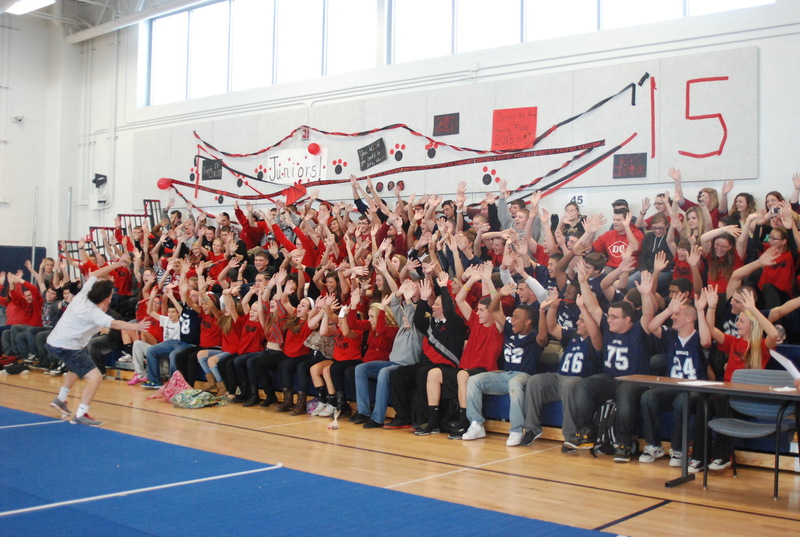 The Class of 2015 at last year’s pep rally. Rockland High students are always willing to to show some spirit and next week will be no exception. Spirit Week, run by the Student Government Council’s Spirit Committee, will kick off on Monday, September 29th. The week will include five different themed days, which are listed below, and will conclude with the Homecoming Rally and football game on Friday and the Homecoming Dance on Saturday. 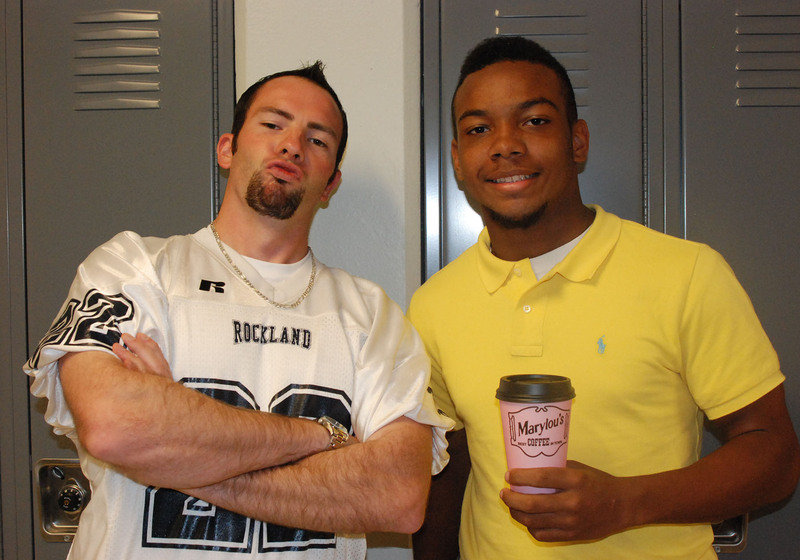 Mr. MacAllister and Leshon Crawford participating in last year’s teacher-student swap day. As in past years it is expected that RHS students will participate wholeheartedly in the events leading up to the football game and dance, celebrating the new school year with undeniable Rockland Pride. Scotland has voted not to secede from the United Kingdom by a margin of 55% to 45%, after nearly two years of rallying for and against the cause. It was not only Scottish adults who played a major role in the referendum; for the first time Scottish teenagers under the age of 18 were permitted to vote. As voters headed to the voting booths on September 18, a final poll showed yes and no votes to be nearly tied. It would not be until the actual votes were counted that a clear cut answer could be made as to whether Scotland would leave the United Kingdom or not. Friday morning results were announced and the naysayers were victorious. Scotland lowered the legal voting age from 18 to 16 in order to allow its teenagers a say in their country’s fate and future. It was thought by some that these teens would not take their voting privileges seriously and vote for independence without thinking. This was not the case according to Jan Eichhorn, a professor of social policy at the University of Edinburgh, who said that Scottish teenagers were more likely to vote against secession. “Overall, they are informed. They have a slightly different way of getting at information. But there’s no evidence to suggest that they’re less capable than adults of voting, from a research point of view,” said Eichhorn in a National Public Radio article. Although teenagers did not make up a large percentage of the population who voted, if Eichhorn is correct, maybe the teenage bracket of voters did make a major impact in the decision, if not through votes, then possibly through influence of their peers and fellow Scots. “Once I’d voted I felt happy. It’s good that younger people are allowed to vote. It’s our future we’re talking about here.” said Brandyn Murphy, a Scottish teenager, as part of The Guardian’s coverage of the referendum. The participation seen with Scotland’s teenage voters opens up the question, should the legal voting age be permanently lowered in Scotland and other countries? Lowering the legal voting age from 18 to 16 is only a two year difference in age and maturity. Most students and teenagers are exposed to politics daily through school, social media, and other platforms. Some say that if teenagers are willing and capable of making an informed political decision then it could make sense for them to have the right to vote. On the other hand, some members of this age bracket may not be prepared to make such a weighty decision at the age of 16. Some may argue that two years can make a large difference in maturity and intelligence. Two years can be the equivalent of two levels in high school in which a student could increase their knowledge of politics and the economy. The overall decision being made through voting, as seen in Scotland, can have a huge affect on these teenagers. If it is going to affect them some how in the future then many say it makes sense that they should have a say in the matter, but at the same time others believe some teenagers might not be ready to hold such a large responsibility at that age. Teenagers these days are well informed of their government and surroundings whether they mean to be or not. Not only are they informed, they are opinionated. Teenagers 16 years old and up can be capable of being just as educated about politics as their elders. If willing to research their opinions and educate themselves about political decisions, many believe teens should not be held back from making choices regarding their government, country, and most of all their future. In the upcoming weeks RHS students, teachers, sports teams, and clubs will be supporting Breast Cancer Awareness month. A variety of activities, including Pink Out Day, t-shirt sales, and, most importantly, the Making Strides for Breast Cancer Walk will take place during the month of October. This year RHS’s donation goal of $3,000 comes with a special incentive. 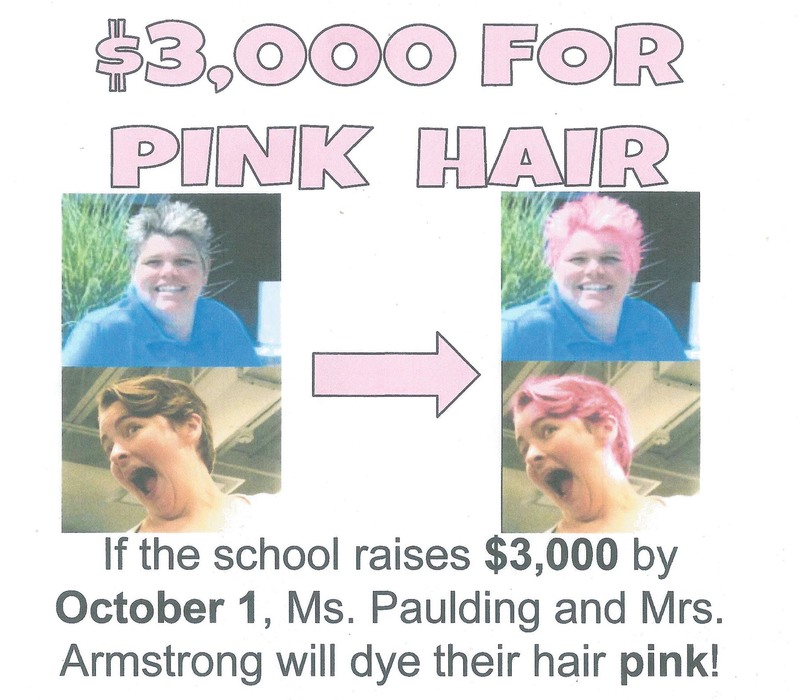 Assistant Principal Kathleen Paulding and science teacher Angelina Armstrong have both vowed to dye their hair pink for the month if this goal is reached by October 1. The school’s overall goal for the months of September and October is $5,000. 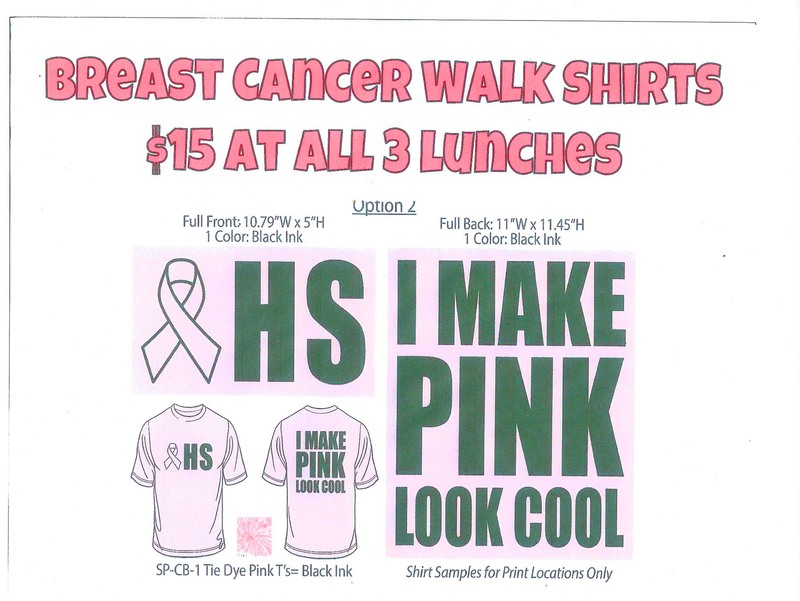 Helping to reach these goals can be done by making donations to the “Rockland High School” team on the Making Strides website or through the purchase of breast cancer awareness t-shirts which are currently being sold in the cafeteria. With a great deal of spirit and support, Rockland High School will help do its part in finding a cure for Breast Cancer in true Bulldog fashion. For those looking to participate in the walk, directions for signing up can be found below. The walk will be held in Boston on October 5. Click here and join the “Rockland High School” team. Through signing up you can create your own personal donation goal and invite others to donate as well. Busses for the walk will be provided but you may also meet the rest of the team in Boston. Click here and select donate to team. Make sure to select “Rockland High School” from the drop down menu. “Back to School Night at Rockland High School is this Wednesday, September 17, 2014. This is a great opportunity to get an overview of the high school, receive information from various organizations, and meet teachers and administrators. Parents/Guardians of seniors: There will be a session with the high school Guidance Counselors in the auditorium. This is a chance to learn more about the college application and financial aid process. All Parents/Guardians: School Administrators will provide important information about the school year and members of parent/teacher organizations will speak briefly about their efforts to support the school. All Parents/Guardians: Follow your student’s schedule for classes 1-7. Please have your son or daughter complete this form for you.